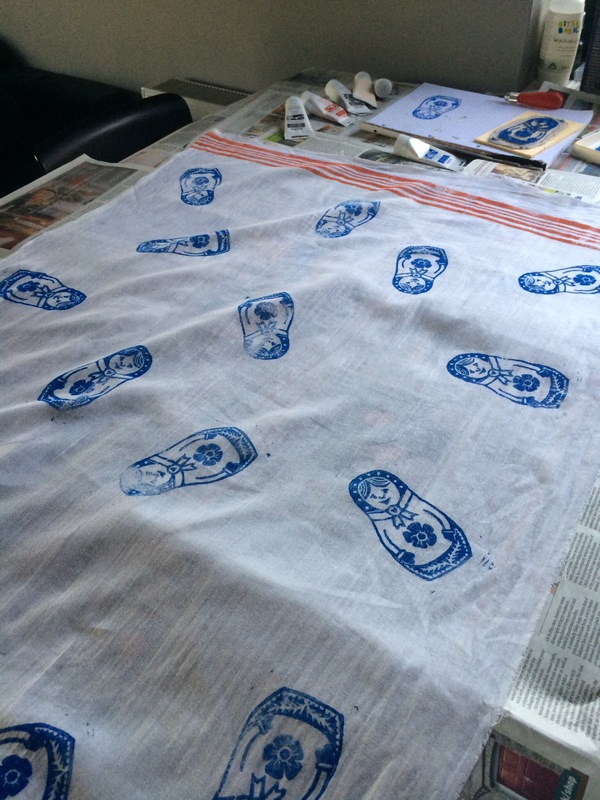 For Mother’s Day this year I decided I wanted to try out some new lino print skills to make a scarf for my mum. I’m not the most imaginative. I can follow a pattern or a recipe or copy a picture but I’ve always found it difficult to come up with drawings from my own imagination. This therefore was a great achievement as this is my own design! 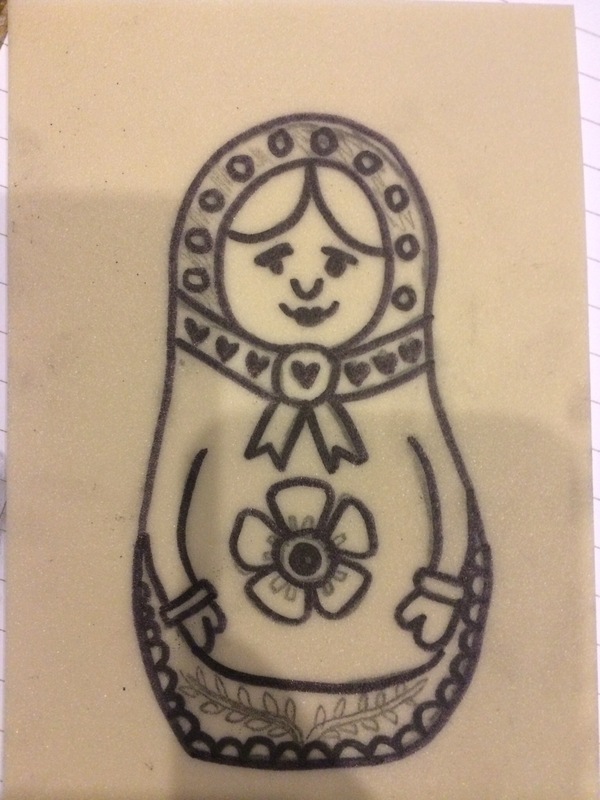 Here’s the design on the lino before any cutting. 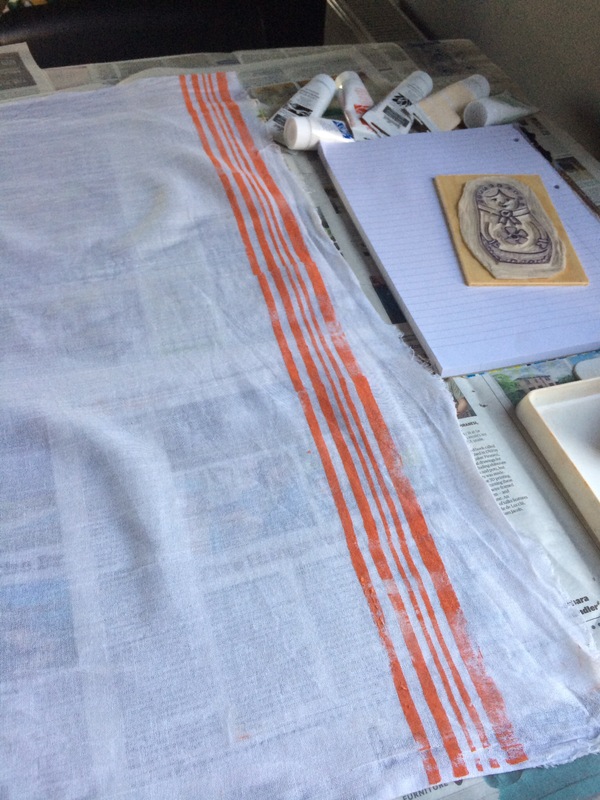 When you start cutting the lino the design can end up being tweaked slightly when you realise some of the small fiddly details are just a bit too difficult. 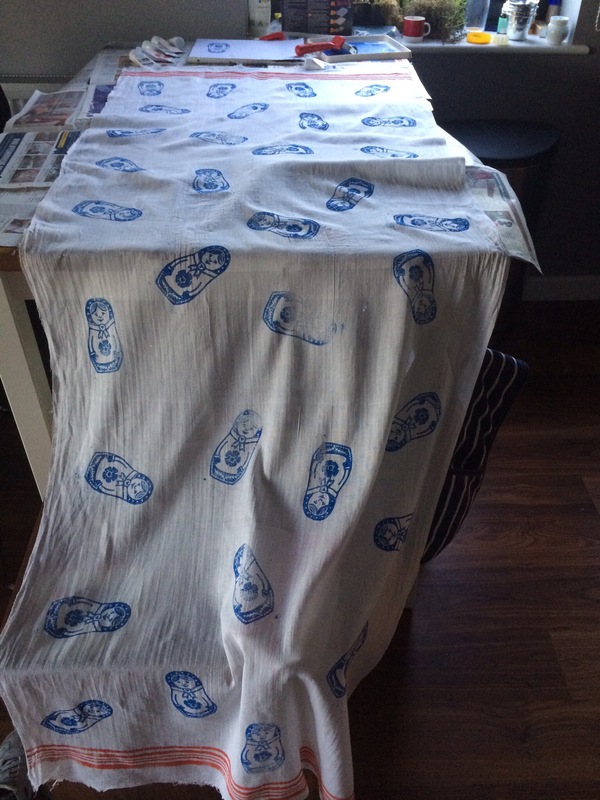 As I wanted to block print onto fabric I mounted my lino onto a thin piece of wood to try to give it some stability and make it easier to handle (wood handily stolen from a wine box!). You can see the mounted block to the right of this photo. The muslin came from ebay and was described as egyptian muslin. 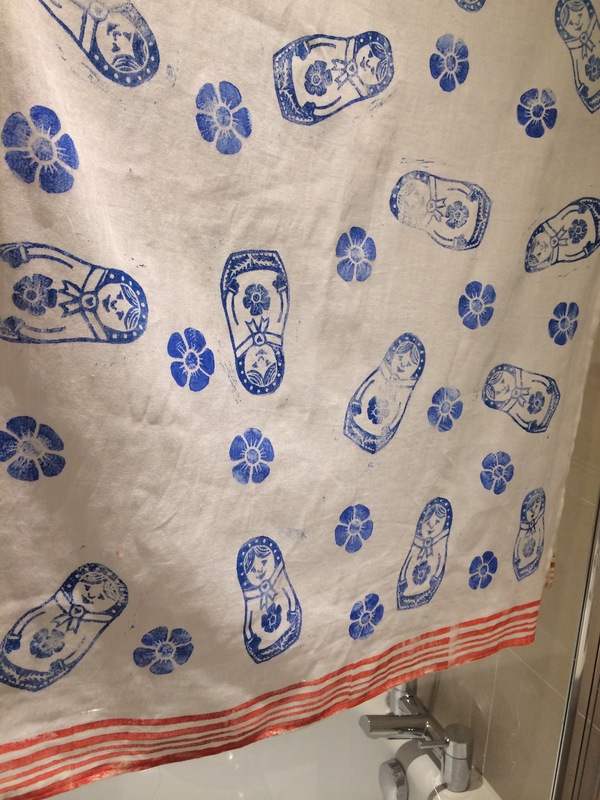 I washed it before printing then ironed to try to remove most of the creases. 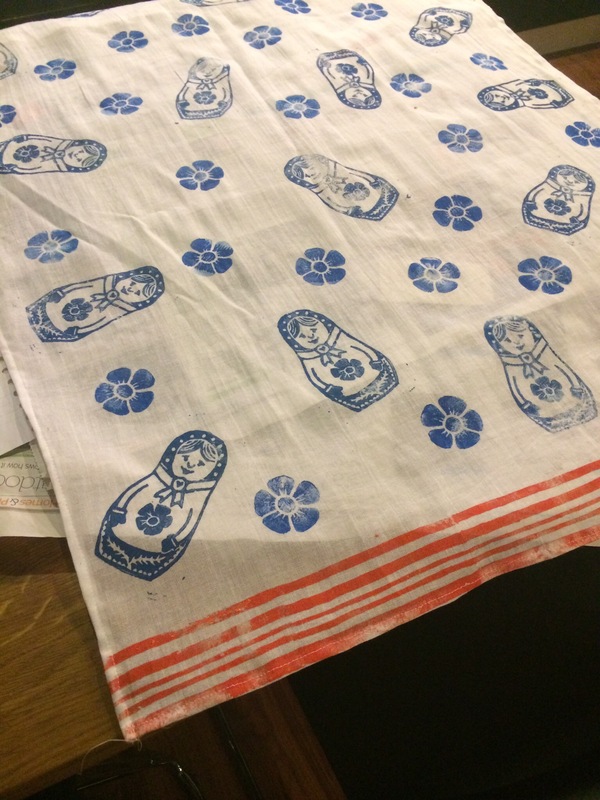 Before printing with the Russian doll I created a striped lino and printed each end of the scarf with a contrasting colour. 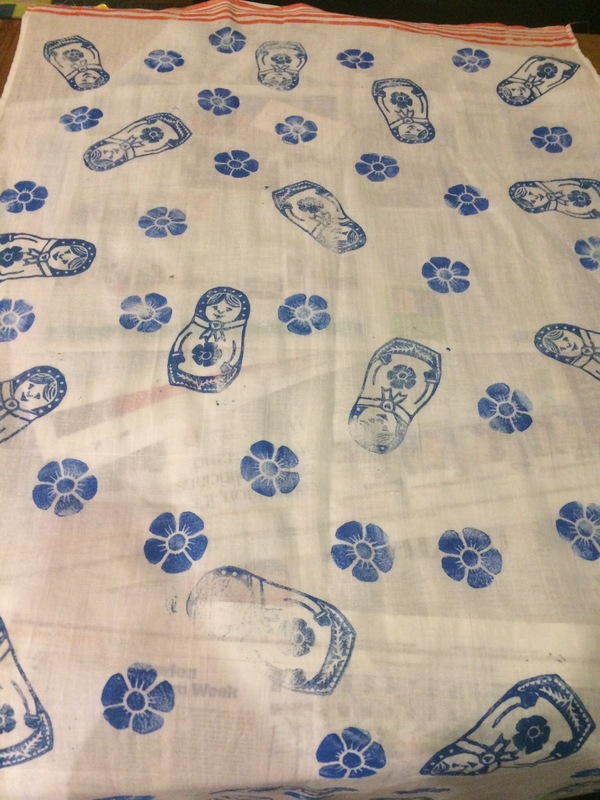 For this project I used Speedball Fabric and Paper Fabric Printing inks. This dried pretty quickly (overnight to be dry to touch) but I left it over my bath for about a week. The ink just needed hot set with an iron. After these I decided to replicate the flower from the middle of the Russian doll to give the scarf a bit more detail. You can see that some of the dolls/flowers look a bit faded. This is where I either didn’t put enough ink on or didn’t press down on the block hard enough. I actually quite like the effect. Whilst I didn’t quite get it finished in time for Mother’s Day, I took it home the next weekend I was home where hopefully my mum was actually pleased and not just being nice to me!